Now you’ve navigated the field, and it’s down to two. You’ve earned a prize of at least three times your buy in (more in a multi table SNG). The rest is all-or-nothing. You will either pick up an extra two buy ins, or nothing. Playing well heads up usually means a little bit of aggression and a little bit of luck. If you take the aggressive approach, you will find your long term heads up results looking pretty good. Heads up play in the final scene of an SNG is somewhat alien to many players. Players that usually play cash games rarely play heads up, and even the average sit and go player will only get heads up 20% of the time. If you practice these general rules, you can master heads up play, especially against opponents who rarely get there. When the tournament is down to two, the button player posts the small blind and acts first preflop (last on other streets). Now that the tournament is heads up, it actually becomes correct to simply call more often preflop, or raise less than all in. Although the blinds are usually high at this point, the average of the two players is also high since everyone else is out of the way. When on the button, there are two compelling reasons to call the big blind with most starting hands. First is the 3-1 pot odds (slightly higher with antes), and second is the positional advantage of being able to act last after the flop. Very few hands should be folded from the button. In fact, it is correct to call with any two cards, but if you have been very active, it is sometimes acceptable to fold a very bad starting hand (maybe 9-4 offsuit or worse) to give the impression that you are being selective. If you have some kind of big hand, it is best to stick in a raise of three times the big blind. Don’t give them a chance to hit bottom pair with a poor starting hand. Also, don’t raise the minimum. You are then giving your opponent 3-1 odds to call. If you call the big blind, and that player checks preflop, you can be fairly sure they don’t have a good hand. Then, when they check to you on the flop, a minimum bet can often take it down. A thinking big blind player can turn that around on you and check-raise the flop, but the stacks aren’t really deep enough for any kind of fancy plays, so if they pull that, you can be relatively sure they have a good hand like top pair or better. It is right to play more cautiously from the big blind, since you will be out of position for the rest of the hand. If you do have a very good (but not great) starting hand, you usually want to raise (or reraise) all in (if it’s not too much of an overbet) to offset your positional disadvantage postflop. If you get a monster starting hand, slow playing it, even before the flop, can be correct. 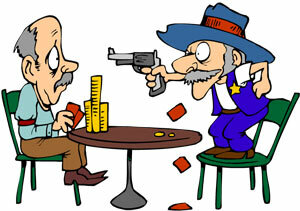 You are trying to induce a bet or two from your opponent, and if you get outflopped, so be it. The flop will miss your opponent far more often than it will give them two pairs or better, so this play can pay off in the long run. Stack sizes are an important consideration. If one player has more than a 3-1 advantage, they should be absolutely ruthless with preflop raises, and most of those raises should be enough to put the short stack all in. The pressure tends to be enormous, and usually the big stack’s advantage goes from 3-1 to something like 5-1 in just a few hands. Now the short stack is forced to call all in with almost anything. If the stacks are relatively even (neither player has more than a 2-1 advantage), play your normal game until that situation changes, for better or worse, then adjust accordingly. Your prime objective in Heads Up is to be aggressive and put your opponent under massive pressure but also to play in position and in consideration of stack sizes.